Water is synonymous with purity. This was the basis for the design of this bathroom collection, with its delicate mixture of organic shapes, geometrical designs and straight lines. Its simple functional design fits in with settings of all kinds. With its subtle combinations and intersecting volumes, everything in Contept flows, with no need for any extra frills. 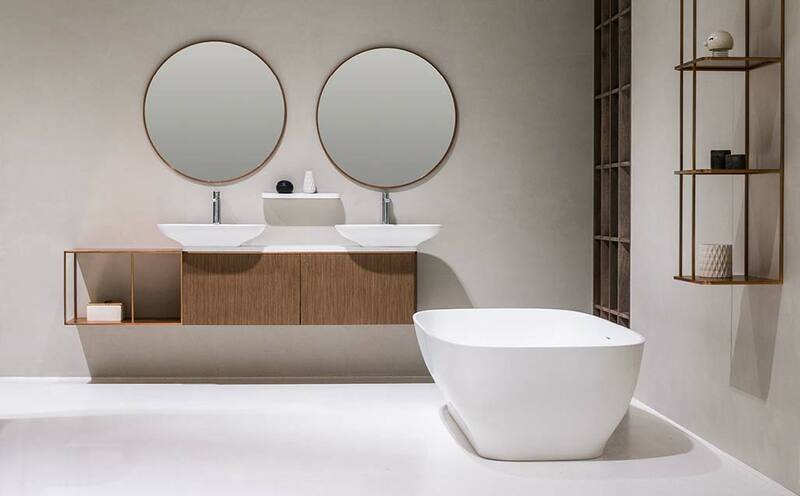 This compact collection can be extended to meet the requirements of each particular project by combining different types of materials with the KRION® basins that form the nucleus and main hallmark of Contept, thanks to their clear-cut shapes, interrupted by subtle lines that mark the intersections between different planes. PURE combines various different finishes so that bathroom projects can be lent a distinctively personal touch. Top-quality wood has been used for the furniture in a natural or white oak or walnut finish, plus metal accessories and features in a black or copper finish, both accompanying the focal point of this series: the KRION® basins, countertops, bathtubs and complementary items. Yonoh is a design studio founded in Valencia in 2006 by Clara del Portillo and Alex Selma. Both trained as industrial designers, they unite their creative interests and work in the fields of product, graphic and interior design. Yonoh’s projects stand out for their simplicity and functionality, with designs with the emphasis on originality and innovation. Yonoh has been singled out to receive leading international awards like the Red Dot, IF Design Award, Good Design and Wallpaper* Design Award, among others.